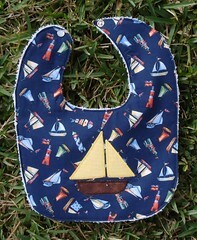 A new bib, created as a custom order for a wonderful customer. I decided to create a few extra to sell in the shop and at Ditto Kiddo. As I was sewing these my mind wandered in all sorts of directions ... first to a new reality show someone needs to create about moms who craft ... challenges like husband is at work for 17th day in a row, it's raining and the kids are stuck inside with little to do and have the flu (lots of vomiting), and the challenge is to create an engaging children's activity out of toothpicks and the contents of husband's workbench while simultaneously updating your blog and your etsy shop and making lunch. Make it work. Or maybe they should give that challenge to someone who hasn't already done that. And, by the by, I'm so disappointed by this weeks elimination on Project Runway, but I agreed completely with the winner. What a pretty dress! My second random thought was about the items I make and how differently they sell at different venues. 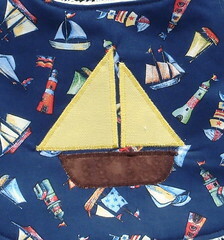 Etsy is great for selling onesies and quilts, Ditto Kiddo is great for bibs, onesies and quilts, and the craft show was great for burp pads, blankets, and quilts. The only theme I see is that quilts do sell ... other than that it's so varied. The success of certain items at Ditto Kiddo is due in part to product placement, I'm sure, as the bibs are hanging right next to the cash register and many of the other items are on a shelf unit that isn't as prone to impulse purchasing. Almost all the customers at the craft show bought a burp pad ... again they were placed right in front, where the sales were finalized. Hmm ... now to figure out how to make everything easily accessible everywhere ... shouldn't be too hard, right? ha ha. Reality show about mom's who craft? Haven't heard of it yet. AND Project Runway my love!! I love the show but always forget to watch. Most of the time I catch up on the marathon days. Must remind hubby to fix the TV just for PR!